FILE - Displaced Syrian children gather barefoot in a refugee camp near Atma, Idlib province, Syria. Nearly 70 million children under the age of five could die between now and 2030 if governments and their partners do not step up efforts to meet development goals, warns the U.N. children’s agency, UNICEF. In its annual State of the World’s Children report issued Tuesday, UNICEF urges governments, donors and NGOs to focus on the most disadvantaged children and close the gaps, giving all young people a better chance at a bright future. 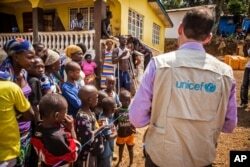 FILE - A UNICEF aid worker visits a home in Freetown, Sierra Leone. UNICEF warns that if current trends continue, and 2030 development targets are missed, nearly 35 million African children could die before their fifth birthdays from mostly preventable causes. Those who do survive will have poor primary school attendance and 9 out of 10 will live in extreme poverty.